I have been wanting to make one of these for a while, I found my inspiration here a while ago. I thought that a Christmas one would be perfect, and I thought it would be fun to make one for my niece. I have all kinds of stuff that my mom made when I was little, and I love taking it out knowing that she made it just for me. Obviously, I have stressed how little free time I have lately, so to me, it makes it even a little bit extra special, I did work on it during the day working from home as I was on conference calls. I am pretty pleased with the way that it turned out, and I think she will really like it. 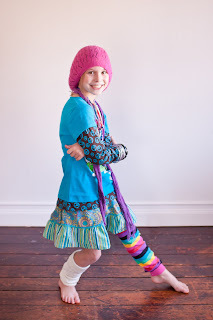 She is a colorful little lady who does not like to match and definitely likes to mix it up. Her room at home right now it a sherbet orange with different colored polka dots. This will be a great addition for her door, and maybe one day she will put it up at her house and tell her kids about her crazy auntie Jilly, who loves her very much, made this just for her. And of course, my colorful niece Miss Grace. . .
LOVE that wreath. She will love it, what a great gift. Wish I had time to throw one together for Meaghan, I will have to keep it in mind for her bday.